The drinking scene in Houston is as unstuffy as ever, with even our most highbrow cocktail bars getting whimsical when it comes to reimagining the classics (think Old Fashioneds, Negronis, Sazeracs, Four Loko). And it probably doesn’t hurt that it’s nearly impossible to be pretentious in a bar culture defined by patios that you can bring your dog to. 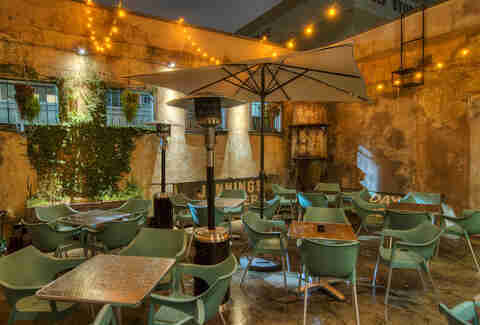 We have funky beer gardens and craft beer havens, spots dedicated to tiki cocktails, whiskey and wine, and easily some of the most unique, spirited, and fun bars in the nation. If you're looking for something new, something old, or something to name drop when your friend's ask "where should we go tonight? ", you've come to the right place. 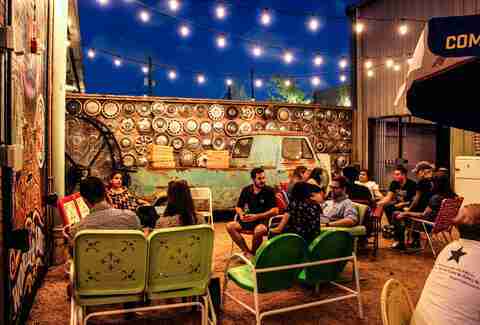 These are best bars in Houston right now. You’ll find exactly zero pastries at this best-in-show mezcalería, which began as a passion project to champion only mezcaleros and distillers using traditional methods to make agave spirits. That passion is still there, but the past couple of years have brought a more fun, lighthearted focus to the bar, with a recharged menu that zeros in on delicious, juice-forward cocktails influenced by the culinary aspects of Mexican culture. Drinks like the Golden Girls -- a vodka, guava, and grapefruit number that Dorothy, Blanche, and Rose would totally get down with -- sit alongside the house favorite Margaritas de la Casa, spiked with either habanero and serrano, strawberry balsamic, or mango and Chamoy. Kevin Floyd, co-owner and CEO of all things hops and barley, takes care to hand-select The Hay Merchant’s rotating list of 80 taps and five casks, and as a surprise to absolutely no one, it’s one of the finest in the city. 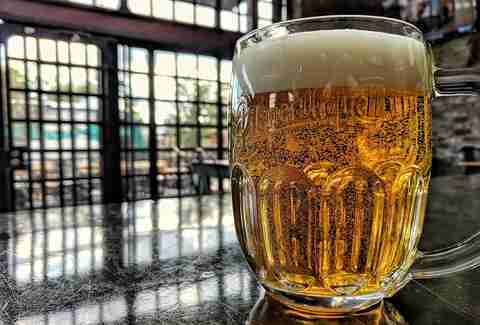 Beer geeks are downright turned on by the bar’s dynamic selection of brews, both local and out-of-staters broken down into categories like Sociable & Refreshing, Hop-a-licious, and Not for the Faint of Heart. Over the past couple of years, the bar introduced its five-years-in-the-making bottle program, featuring an 80-deep list of bottles, and a refreshingly cool cocktail program, with drinks on tap, stirred and frozen. Spending your hard-earned cash on drinks becomes easier when you know you’re drinking for a cause. 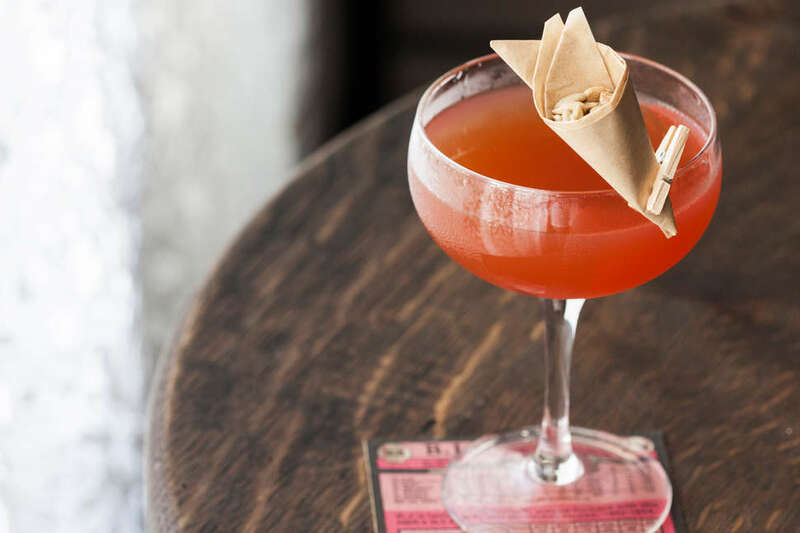 Enter OKRA Charity Saloon, a non-profit bar that gives its proceeds to a different charity every month. Here’s how it works: Every drink you purchase earns you a vote, so the more passionate you are about a cause, the more “fun” you’ll likely experience that evening. Narrow, exposed brick walls, a gorgeous original circle arch and barrel vault ceiling, gas light fixtures, and a fine-looking central bar give the space a beautiful aesthetic to match its heart. Combined, the entire atmosphere makes you feel good about that last shot of Fernet. Bobby Heugel’s first bar put Houston’s cocktail scene on the map, with a focus on form and a robust collection of house-made bitters, sodas, and infusions. The team at Anvil deserves to be taken seriously too, as the staff goes through an intense training process ending with a 50 count blind taste test, and several of the highly skilled alums have gone on to open some of the most exciting bars in town. 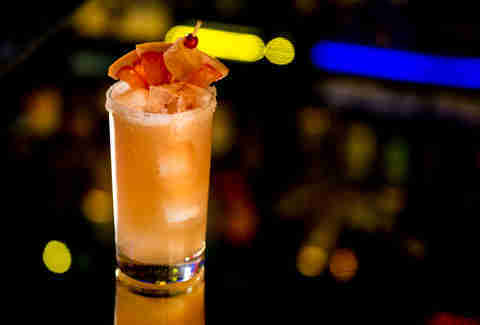 Cocktail fiends can and should journey through the 100 list, a bucket list of the bar’s take on iconic classics, and those looking for a taste of the unknown can get it through the menu’s seasonal revamps. 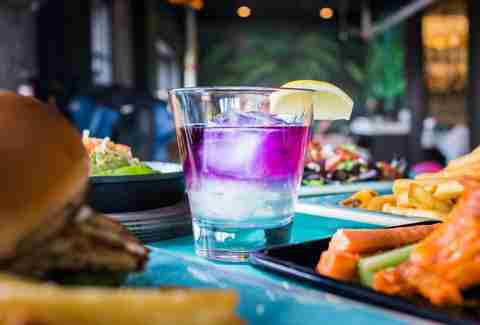 There’s also a cool as hell break-even bottle program to make luxurious sips more affordable, and the bar’s most recent renovations added a fresh new look and booths with charging stations. Winos should head straight for this masterclass, European-style enoteca, which prides itself on storing wines at a temperature that you would never, ever guess by its name. 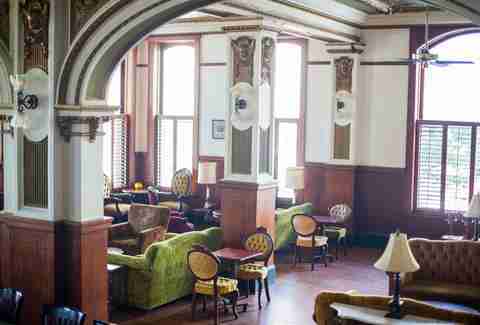 Housed in a swanky '20s-era building that makes for the perfect date night, its extensive 450+ library of global selections is one of the best in show. Get offerings by the bottle, glass, half-glass, and taste, and do it alongside damn fine charcuterie and bar snacks, wine-centric dinners, pop-up tastings and art installations, and a special list of Sunday bottles help to raise your enjoyment levels that much higher. Justin Burrow stacks his narrow Downtown stunner with what may be the widest selection of interesting spirits outside of Anvil (he was one of the original partners there, not surprisingly). 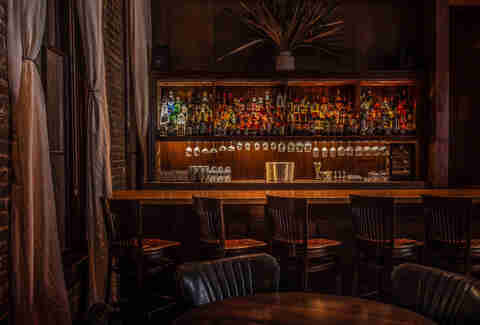 Though the interior is dark and moody, the vibe is casual and friendly, with boozed-up, old-style cocktails laced with elderflower and spiced wine syrup. On nice nights, they are best enjoyed on the balcony with a view down Main, though on quiet nights, chatting with the ever-talented staff behind the bar is equally as refreshing. This Southern charm has been making Houstonians swoon since 2014, earning its stripes as one of the best cocktail bars in America just one year later. In addition to masterful odes to the bar’s namesake drink, bourbon boss Alba Huerta ups the game with a flourish of back porch inspirations that read like a history book of the South. Housed in an industrial 1880s uniform factory, the space is just as stunning as the lineup of refreshing juleps, bold Sazeracs, and hot and sour Creole rums, with a gorgeous copper bar and sophisticated details that give you all kinds of feels. 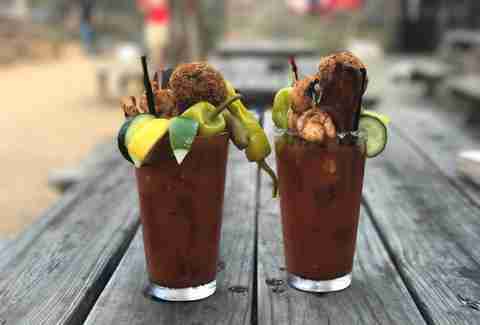 To the old Southern grandeur, slurp your drinks alongside a platter of oysters. Hammocks and beer. Could a lazy afternoon get any better than that? It can here, because there are also bar games, picnic tables, food trucks, the occasional live music, and a next-door pizza joint that will bring garlic knots straight to you. Hanging out in this super-chill beer garden is the day drinking equivalent of going to a spa (especially during prime patio season). The eclectic collection of craft beers -- poured from cool-looking tap handles by Venezuelan-based artist, Maria Rangel -- only brings your relaxation to the next level; and those that prefer cocktails or wine can get down with choices by the glass and bottle. Bonus: You can get a 5% discount by coming on foot, via bike, or by ride-sharing (basically any way of transport besides driving yourself). When a James Beard Award-winning chef teams up with a master sommelier to open a whisky-fueled side project, you pay it a visit. But not just once. In fact, you should find yourself constantly frequenting this wine and cocktail bar, housed on the first floor of the 1884 Cotton Exchange building. Sink into the plush sofas to embark on a classy buzz off Justin Vann’s boutique selection of hard-to-find Old World wines and New World classics, plus ciders, beers, and simple tinctures that you can sneak in as you please. When you’re hungry, Justin Yu’s house-made baloney, served warm with smoked cheese spread and Ritz crackers, fits the bill perfectly. This throwback ice house was around before refrigerators became an “it” thing to do. Open in 1928, locals frequented the spot to get ice blocks and a couple of cold ones before heading home for the day. Today, they’re doing the same damn thing, minus the ice and adding in tacos al pastor from the nearby Tacos Tierra Caliente truck. West Alabama Ice House’s sprawling patio and tiny indoor space is so unapologetically no frills, it earns your instant respect. As such, you’ll find all walks of Houstonian life sharing tables and laughs, from bikers and CrossFitters to some guy rocking the hell out of a Fu Manchu. Whiskey, beer, and tacos. 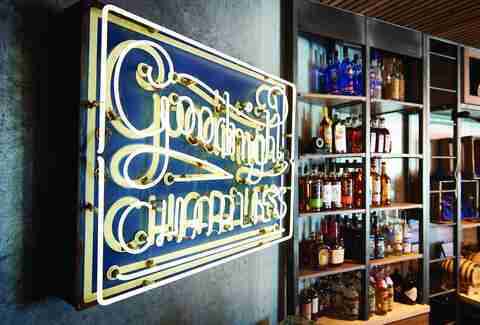 You really only need one of the holy trinity to survive in Houston, but this Agricole Hospitality bar number has all three. 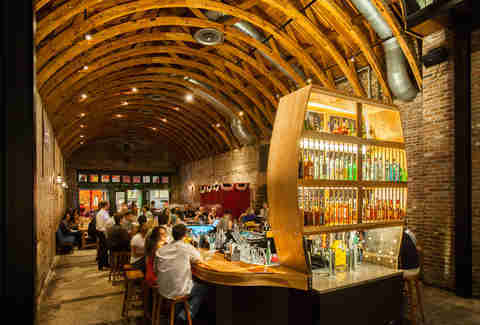 Named after the heirloom corn that was the first corn ever distilled into whiskey in the US, the modern icehouse and lounge carries over a hundred selections of whiskey, including proprietary barrels of bourbon that beverage director Morgan Weber hand-selects and showcases in a cool looking rickhouse-like structure behind the bar. Food comes from the food truck, with the menu created by Agricole’s other half, Chef Ryan Pera. Take down short pulls like the Hell’s Bells -- a shot of Buffalo Trace with a shot of Revival b&b pickle brine and a Lone Star -- alongside superior-quality, scratch-made tacos filled with things like braised beef cheek and Berkshire pork collar carnitas. Look out for the the bar’s seasonal events, from crawfish boils to a weekly outdoor cooking series. 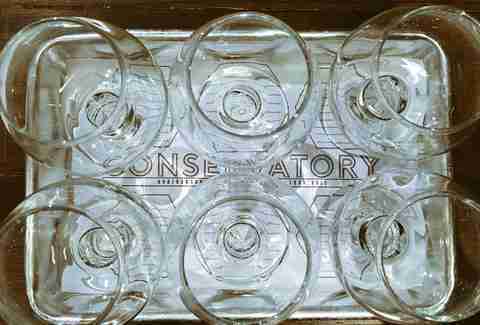 In 2016, Houston added its first underground food and beer hall, Conservatory. Travel down the rabbit hole (read: the cool art deco staircase) and you’ll find a modern, bustling food hall back-splashed by a 60-count craft tap wall. If there were ever a place to escape the Houston sun for some cold ones, this is it. The lineup of food vendors switches every now and then, but expect things like BBQ, tacos, pizza, and poke, plus the occasional pop-up. In 2017, the excellence continued with the flowing wine taps of Noble Rot Wine Bar, set behind the stairs and serving a smart collection of wines by the glass and bottles. 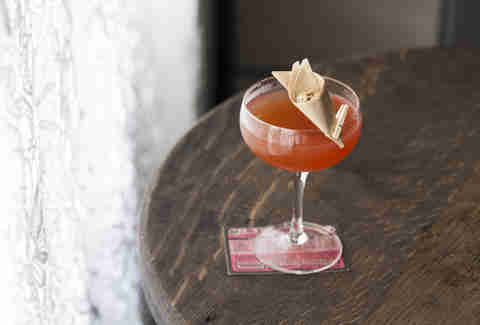 The now 10-year-old favorite is known for a roster of whiskey that goes unrivaled in the city. Sip on selections from far and wide, including East, West, and Mid-Coast varieties and an entire library dedicated to the ruckus juice of Kentucky. All that plus international blends from Scotland to Japan. The expert staff also gives its cocktail list seasonal facelifts, mixing up bold, seriously boozy creations alongside special tastings to keep your experience perfectly on point. 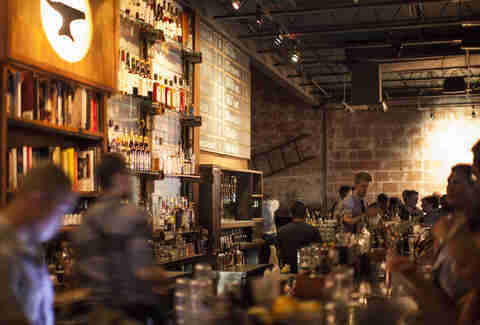 Pay it a visit to see why we named it the best whiskey bar in Texas. The guys behind Grand Prize Bar and Moving Sidewalk teamed up with Treadsack to open this vintage neighborhood joint in the Heights just a few years back. Today, all 10 of its expertly balanced classics remain just $8 a pop, and the seasonal menu and well-versed selection of spirits keep regulars on their toes. 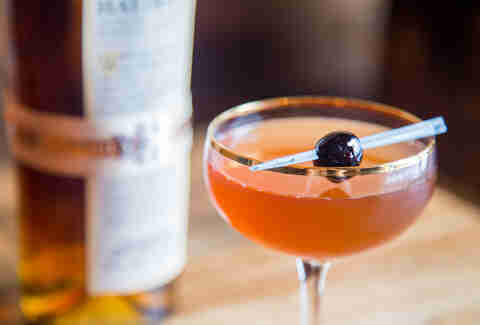 Go from a Michelada-inspired cocktail named The Upward Swing -- made with pale ale and house sweet pepper jam -- to a Boiler Maker, which takes a Lone Star and Mellow Corn whiskey pairing and turns it on its side with Luxardo cherries and an Angostura-dipped orange peel. With only a few years under its belt, this very relaxed craft cocktail and beer garden feels like it’s always been a part of the Midtown scene. 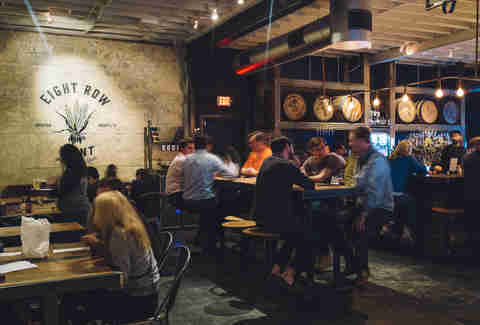 We don’t know what’s better: the fact that it has 49 on-tap brews running from the dark and savory to the sour, funky, and alluring, or the fact that the barkeeps pull out all the stops with showy concoctions featuring thoughtful touches -- think infusions of fruit that get smoked with wood chips from repurposed whiskey barrels. Plus, there’s house-made Fireball -- made with a kiss of cinnamon, molasses, and straight-up bourbon -- that will put any shot you’ve taken in the past to complete shame. Thought Houston was missing a formal cocktail bar experience? So did mixology mastermind Bobby Heugel, who quietly opened this gem in early 2017. Housed in a nearly 120-year-old building and accessed through a staircase in the back of The Pastry War, the 25-seat space offers 15 cocktails (Japanese highballs, swizzles, and Sazeracs), plus a handful of beer and wine selections; and it does so with the highest level of service -- think top-tier, chilled glassware, complimentary house snacks and hot towels, and bowls of hard candies with your check. 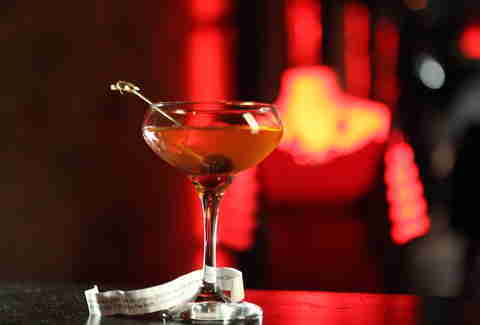 Behind the bar, you’ll find the city’s top, fresh-faced talent. Reservations are accepted, with around half the seats kept available for walk-ins. 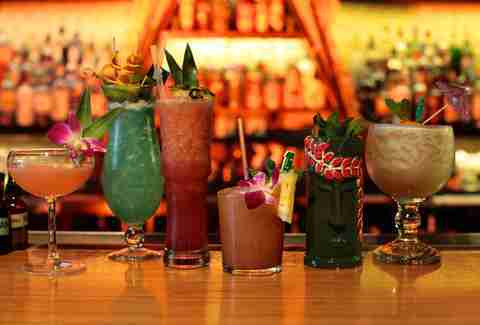 Fan-favorite tiki bar that will have you screaming “Okole Maluna!" In the spring of 2017, heavy-hitters Bobby Heugel (Anvil, Pastry War, Tongue-Cut Sparrow) and Justin Yu (Oxheart, Theodore Rex, Public Services Wine and Whisky) opened this neon-lit spot in the former Dry Creek space, tapping the talented Terry Williams as Operations Manager and wunderkind Alex Negranza as Bar Manager. Justin Vann (Public Services Wine and Whisky) takes care of the aggressive wine list, which features a weekly break-even wine selection modeled after Anvil’s spirits program. Here, Bobby, Justin, and crew fly beyond the rigid structure of serious cocktail bars and tasting menus, showing off a sense of humor with everyday food, a short and smart list of original cocktails, and a chilled out, neighborhood vibe. Pair a Japanese highball with the euphoric Party Melt, a riff on a patty melt that is equal parts crispy, beefy, and juicy. This two-faced powerhouse offers a 94-tap beer and wine garden on one side and a craft cocktail and whiskey den on the other. 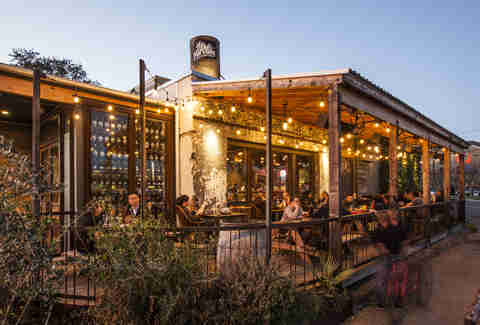 In between, you’ll find a courtyard with plenty of shaded benches, swing seating, fire pits and a packed crowd getting down on saisons and IPAs and smoky mezcal and bourbon numbers (as well as pork shank platters with 'nduja). 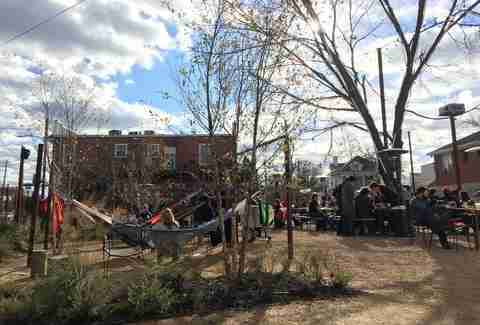 Serious efforts are taken to keep things cool, in both the theoretical sense -- stylish aesthetic, dog-friendly patio, boozy brunch -- and literal cold sense -- there’s a three-sectioned temperature-controlled cooler at the biergarten and a crystal clear ice maker at the cocktail den. In 2017, the Heights got its first taste of King’s BierHaus, an offshoot of King’s Biergarten in Pearland (and a much cooler one at that). As a surprise to no one, the fun-loving neighborhood welcomed the concept with open arms and loosened lederhosen. The 400-seat, 9,000-square-foot indoor/outdoor watering hole takes a much more modern approach than the original as the bar’s signature liters and wursts are mixed with German-American tastes and the space is ostensibly an adult playground -- think giant communal tables, corn hole, ping pong, live bands, and a bunch of hammocks (because those “das boots” are no joke). Those looking for something besides world-class beers (a blend of German, local, and European) can visit the extensive list of whiskey, sip specialty cocktails and German and Austrian wines, or hit up the largest collection of authentic schnapps in Texas. Any time is the perfect time to hit Cottonwood’s fantastically large patio. Repping a full bar & kitchen and a roster of entertainment that runs the gamut from live music and crawfish boils to corn hole and late-night fireside chats with your pup, the indoor/outdoor bar exudes easy livin’. Go for the enviable selection of beverages, including Texas and Kentucky brown stuff and 42 beers on tap (two of which are cask-conditioned), stay for more of said enviable selection of beverages because you’re probably going to be here for a while, and it’s almost impossible to have just one. If you get hungry, get a burger stuffed with poblanos and sloppily stacked with bacon, chiles, cheese, and a fried egg. The monster truck-sized beer garden is a carnival for grown-up kids, rocking live music, flat screens, food trucks, and a legit ferris wheel (pay $10 and you’ll get a spin and a drink). Snag some open truck-bed seating or an umbrella-shaded picnic table and laze the day away with trash can punch, strawberry spritz, and mojitos, mules and margs on draft. When the weather doesn’t mesh with sitting in the yard, there’s covered patio seating and an indoor bar (which also houses a Philly cheesesteak food court). 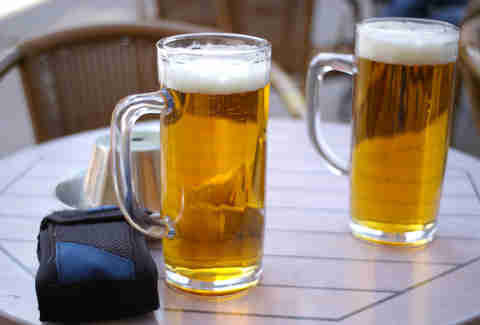 Bonus for those with babies and fur-babies, the bar is kid-friendly till 9pm and pet-friendly all night. Wooster Garden and Heights Bier Garten’s youngest sibling may be the best-looking of the bunch. 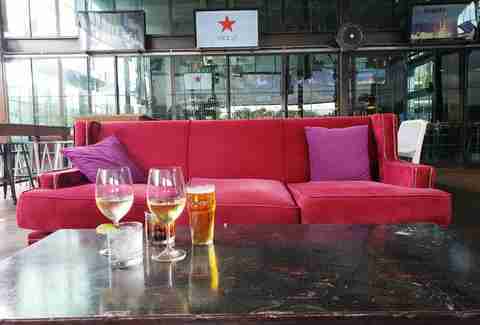 Set in the old VrSi space, the cool, indoor/outdoor bar is sittin’ pretty with sky-high ceilings and windows, a mini second-story terrace, gorgeous pavilion, and a wealth of seating wrapped around the place (including plush velvet couches and swings). Join the crowd to indulge in a lineup of 100 craft beer and wine taps -- all controlled in a three-zone cooler to get you a properly crisp pilsner or cellar-temp Cab Franc -- plus frozen cocktails courtesy of Wooster’s. Food and shareable snacks will help you stay longer, from tandoori nachos to bulgogi beef burritos. You’ll need to bring your dancing (and drinking) shoes to this new honky-tonk, the first in a lineup of establishments from Goodnight Hospitality (wine bar and bistro Rosie Cannonball, Montrose Cheese and Wine, and an intimate Mediterranean spot March are slated to open in Montrose in 2019). 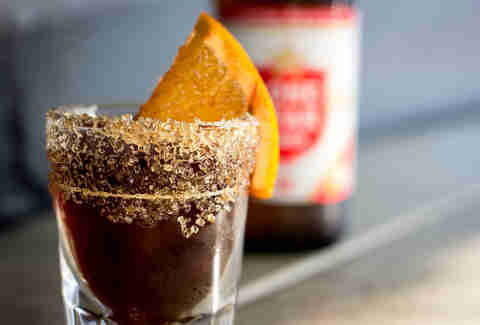 Alongside its lineup of Texas craft brews and fine bourbons is a list of simple but not-so-basic highballs and stirred drinks -- from an Espolòn Blanco tequila-infused Ranch Water to the Horse’s Neck, a drink made with Goodnight Charlie’s Elijah Craig 11-year Bourbon and housemade ginger beer. Wet your whistle, try your hand at the Texas two-stop, and finish the evening with lamb barbacoa tacos and five-leches funnel cake. 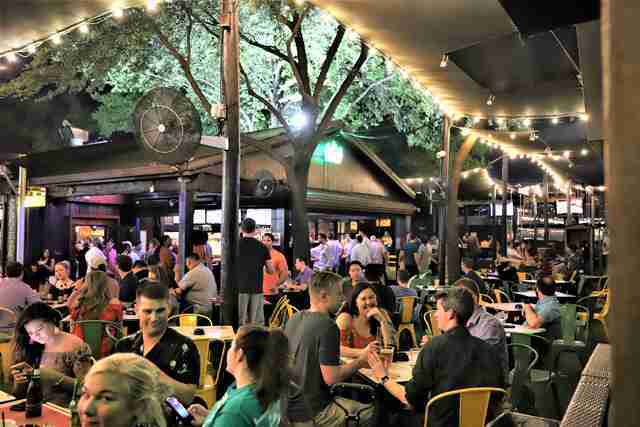 This well-known party spot has changed a lot over the years, first adding a full liquor license after operating as beer-only joint, and now getting some much needed botox, transforming its patio space into an absolute outdoor oasis for those 21+. Fun swing seating, life-size Connect Four, and plenty of outdoor misters keep things cool outside year-round, while the fully-stocked indoor bar has all the provisions you’ll need. And don’t miss turtle racing season running every Thursday night, beginning in early March and going through fall. Fun times are in your future at Present Company, a brand-spanking-new haunt in the totally revamped Royal Oak space on Westheimer. The kitschy space will take you straight to Palm Springs, as it’s adorned with chandeliers, neon signage, palms, and flamingos, plus a large backyard vertical garden -- which you will assuredly snap a selfie in front of. 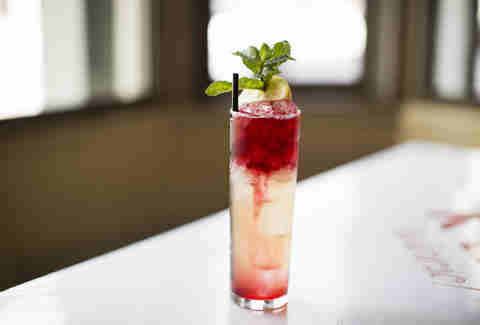 Festive drinks -- including two refreshing numbers served in LaCroix cans -- are from the mind of beverage director Rex Nielsen (formerly of Stone’s Throw), alongside rotating frozens, beers, and wines; while shareable foods like bar pies to truffle fries come from The Burger Joint chef Matt Pak. Reserve 101’s Mike Raymond strikes again with Cottonmouth. Here, Raymond and veteran bartender Michael Neff have created their own whiskey program, blending expressions and aging those blends in bourbon barrels from Houston distillery Yellow Rose. 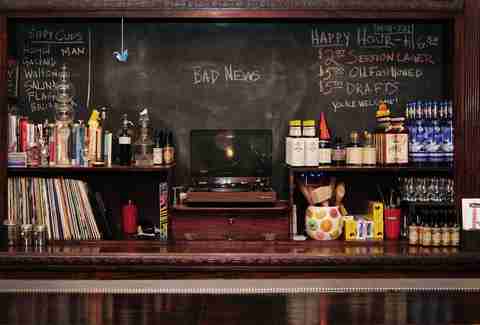 And though it may sound upscale, this bar is decidedly un-fancy. 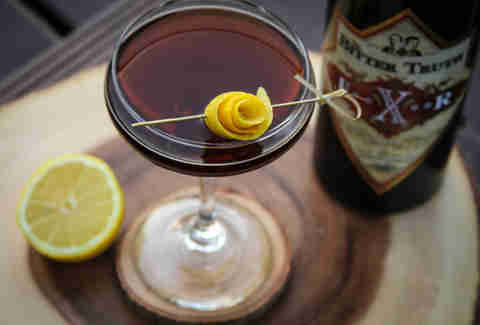 Instead, the team has worked to create “the least cocktail-y cocktail bar we could come up with,” one that appeals to both cocktail nerds who appreciate long-form drinks with a garnish or two and Downtown bar-hoppers looking for some good clean fun in the form of Lone Stars and badass music. 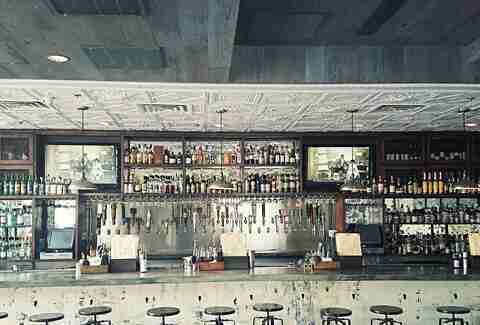 Brooke Viggiano is a Houston-based writer who doesn’t discriminate against types of bars. Find her championing wine, beer, and whiskey @BrookeViggiano.